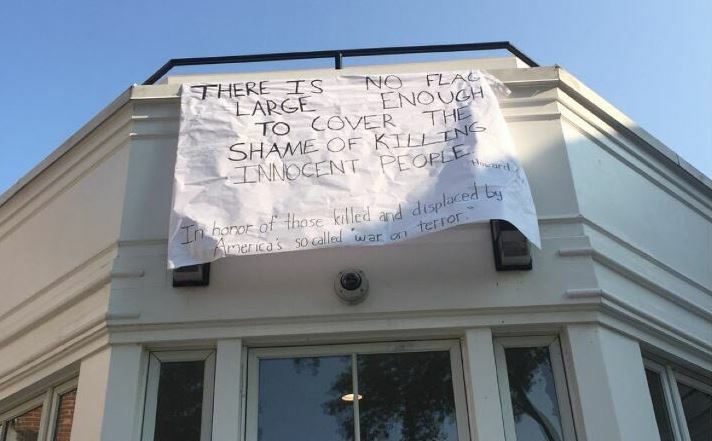 Amherst College has slammed a “deeply insensitive” anti-war banner which emerged on the 9/11 anniversary, while the institution remembered those killed in the attacks. However, the college says it will not be removed, falling under the right to free speech. The banner – which was unfurled on Monday, the 16th anniversary of the 9/11 attacks – hangs in a prominent location, over the doorway of a campus dining hall. “There is no flag large enough to cover the shame of killing innocent people,” the banner reads, using a quote that is largely attributed to American historian Howard Zinn. “In honor of those killed and displaced by America’s so called ‘war on terror’,” reads a second quote.